Rutsky, Yosyf [Рутський, Йосиф; Ruts'kyj, Josyf; secular name: Іван Велямин; Ivan Veliamyn], b 1574 in Ruta, near Navahrudak, Belarus, d 5 February 1637 in the Derman Monastery near Dubno, Volhynia. Uniate churchman. He was raised as a Calvinist but came under the influence of Jesuits and converted to Roman Catholicism (1592) while studying in Prague. 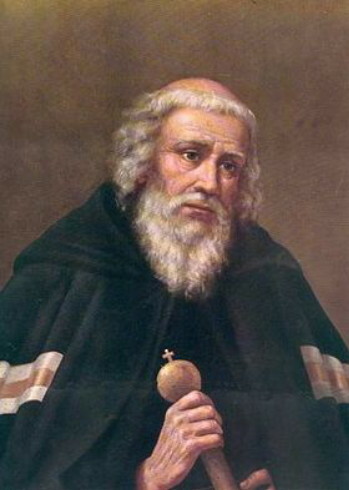 After finishing his theological training at the Saint Athanasius College in Rome (1603), he converted to the Uniate rite at the request of Pope Clement VII and moved to Vilnius. In 1605–6 he traveled to Moscow with a papal legate. He entered a monastery in 1607 and worked with Yosafat Kuntsevych to reform monasticism in Belarus and Ukraine. In 1611 he was made an archimandrite, and in 1613 he succeeded Ipatii Potii as metropolitan of Kyiv. As metropolitan Rutsky sought to place the Uniate educational system on a par with its Latin rite counterpart. He obtained privileges for the church, including stipends for monks to study in Rome and in Catholic academies elsewhere, and implemented measures to raise the level of teaching in Uniate schools. In 1616–17 Rutsky established a unified structure for the Basilian monastic order which made it independent of local bishops. He also placed the Basilians in charge of a reformed school system and laid plans (discussed in 1626 at the Synod of Kobryn) for establishing a theological seminary in Minsk. Finally, Rutsky demanded (through petitions to King Sigismund III Vasa, speeches in the Diet, and discussions with Vatican officials) and obtained (1624) church legislation that prohibited Catholics from freely changing their church rite. In 1624 Rutsky started discussions with Orthodox church leaders, including Yov Boretsky, Meletii Smotrytsky, and Petro Mohyla, about the possibility of uniting the churches under a single Patriarch of Kyiv. Nothing had been realized from these negotiations by the time he died in 1637. He was buried in Vilnius, but in 1655 Muscovite soldiers removed his remains to an unknown location. A collection of Rutsky’s letters, edited by A. Welykyj (Atanasii Velyky), appeared in Rome in 1956.